For a number of reasons, I have been thinking about road closures this week. They have benefits for walking and cycling as well as making places more civilised. This post explains the process taken to get a road closed to traffic. 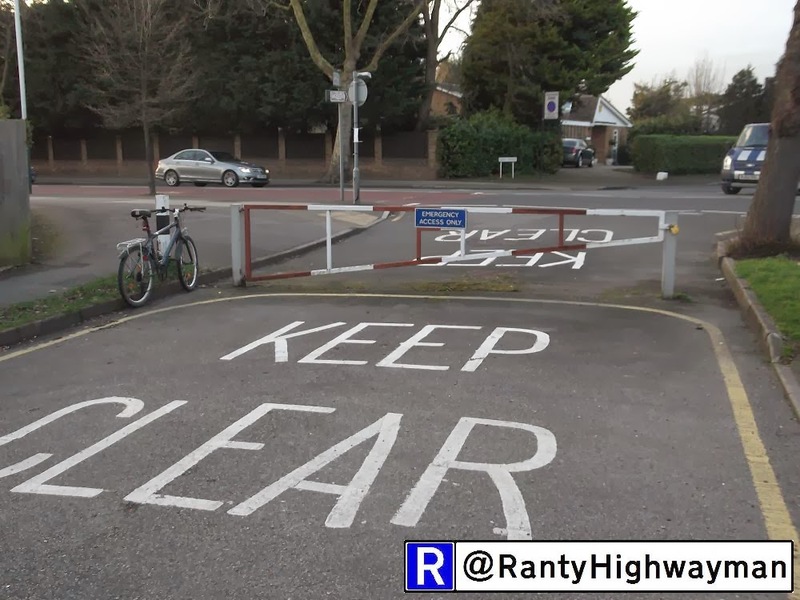 One thing which has me thinking is that we have a scheme in work which is about to start on site which rips out an ugly old fire gate with notional bike bypasses and replaces it with a little bicycle junction. It is a tiny scheme in the grand order of things, but it will be the first one done well (I hope) round our way (I will post before and after when it is done). The work forms part of a larger, but still modest scheme to introduce a 20mph Zone in some back streets which allow an easy bypass of some busy roads. The area carries a couple of signed cycle routes and so we had the perfect opportunity to sort out the horrible old gate. As with everything in local government, there was a process to follow and the old road closure didn't "technically" permit cycling, so we have sorted it. 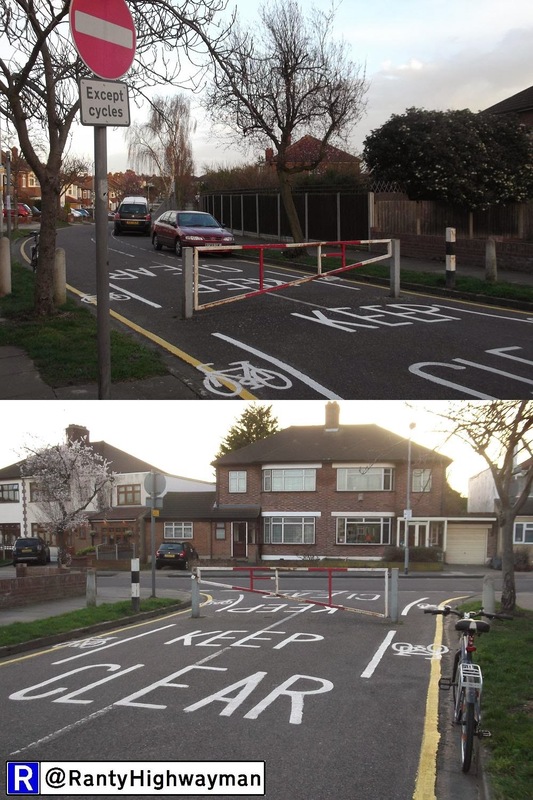 allows cyclists to pass. Not pretty, but does the job. I have often said that road closures are a great tool for helpful civilise local streets, although there is a risk that inappropriate traffic gets sent elsewhere (this scheme doesn't!). So, what is involved? Different authorities will have different procedures for formal decision making, but essentially the legal process follows below. First, we have to deal with some legislation and for road closures, this is the Road Traffic Regulation Act 1984 and allows all sort of maniacal manipulation of movement. We are interested in Section 1 which gives the power to regulate and Section 2 which tells us what we can regulate. In London, we need Section 6 in London which gives the power to regulate and Schedule 1 which again tells us what we can regulate. No idea why London is different, but it is bound to be a quirk of history! 1. For prescribing the routes to be followed by all classes of traffic, or by any class or classes of traffic, from one specified point to another, either generally or between any specified times. They are basically the same and we don't need to worry too much as the TRO will explain what is prohibited and excluded! So we have the powers, how to we get a road closed? I am going to stick with permanent closures for this post - the use of temporary or experimental powers will make a post in its own right! The process by which we "make" a TRO is set out in The Local Authorities' Traffic Orders (Procedure) (England and Wales) Regulations 1996 and Scotland has its own version (which has differences). Both are similar in they set out the procedure which should be followed (I will stick to England & Wales as I am more familiar with the process!). Such other organisations (if any) representing persons likely to be affected by any provision in the order as the order making authority thinks it appropriate to consult. Closed to all vehicles, but with bypasses left for cyclists. It is good practice for a local highway authority to maintain a list of consultees and regularly review them. In my authority, we maintain a standard list and we contact organisations annually to ensure we have the right contact points and if they wish to remain (other than those we are required to consult). Oh, and we consult the police too, although this is buried in Part III of Schedule 9 of the Road Traffic Regulation Act 1984! In undertaking consultation, the local authority will need to publicise the proposed order and this can or must be done in a number of ways. It must publish a notice in a newspaper circulating in the area where the scheme is proposed. In London, this is also the case and the notice must be published in the London Gazette. (iii) the delivery of notices or letters to premises, or premises occupied by persons, appearing to the authority to be likely to be affected by any provision in the order. In other words, authorities outside London could use the London Gazette, display notices on site and undertake a letter drop. Notices are often in a written format describing the proposals, but they could include a map which might be a lot easier for people to understand. Often, a letter is delivered to residents and businesses potentially affected - it doesn't need to include the notice and so could be made more user friendly. Of course, many authorities place consultation information on their websites which is a little more modern! The authority also has to send a set of the same consultation information to the organisations is must and chooses to consult. A full set of documents also needs to be "put on deposit" which in practice means the documents being available for the public to view at the authority's principle office (Schedule 2). This includes the notice, a copy of the proposed order, relevant maps and a "statement of reasons" - why is the TRO being proposed - this information must remain on deposit for 6 weeks after an order is made or a decision is taken not to make it. Anyone can object to a proposed TRO, but as a minimum they must do so within 21 days of the proposal being published and that includes those who must be consulted (and also who the authority has chosen to consult). This covered in Section 8. There is no requirement in law for authorities to take objections verbally (although there will be some people in the community will not be able to give written objections and this should be treated sensitively). Objectors must also give a reason and it must go to the address on the notice - in practice, many authorities provide a written address and an email address, but of course a web form set up for the scheme is another method. There is also no requirement in law to consider representations in support of a TRO! Therefore, once the consultation process has ended, the authority can then decide whether or not to make the TRO. The decision-making could be by anyone in the authority so delegated and could be a senior member of staff, a committee, a cabinet member, a council leader or an elected mayor (i.e. a Mayor with executive powers). The authority then needs to publicise that it has made the TRO - this is actually a printed version of the TRO which carries the seal of the authority and is signed off by relevant people (head of the legal department and mayor is common). The publicity requirements are similar to the proposal requirements and are set out in Part III - only the objectors need to be informed, but normally those consulted are informed of the outcome. have taken to make this work for cycling. The final things is then to make sure that the correct traffic signs are in place and away we go (or not if we are closing the road!). There is actually a procedure for holding a public inquiry which will only affect a TRO for a road closure if it affects public service vehicles - i.e. buses. If a scheme involves closing a road to buses and it has got this far, there are serious problems! So, what does all of this look like, well first a notice is required to have certain information provided as set out in Parts I and II of Schedule 1 which is essentially the what and where of the TRO - the "why" having been given in the "statement of reasons" I mentioned above. 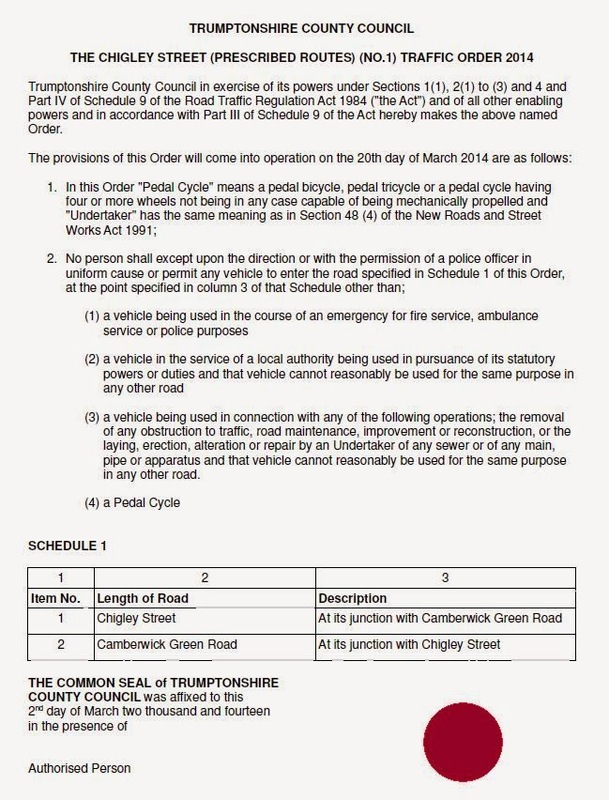 A copy of this Notice, the proposed Order, plan showing the length of road affected and a statement of the Council's reasons for proposing to make the Order, may be seen online at www.tcc.gov.uk/tro. These documents may also be examined at the Customer Service Centre at County Hall, Trumpton between 9am and 5pm, Monday to Friday. All objections and other representations relating to the proposed Order must be made in writing and all objections must specify the grounds on which they are made and should be sent to the Chief Engineer, Highways, County Hall, Pippin Fort Road, Trumpton, TR1 1AA, quoting TRO 001/14 or by e-mail to highways@tcc.gov.uk or online (see details above) no later than 12th April 2014. I have called this TRO a "prescribed routes" order, but it called be called a "prohibition of driving" order or a "road closed to motor traffic" order. There are no hard and fast rules, it will often be down to local practice - the important thing is that the notice has to make sense. In this TRO, I have essentially banned all traffic from using this junction, except for cyclists, but I have left an exemption for emergency vehicles, road maintenance and utility works. 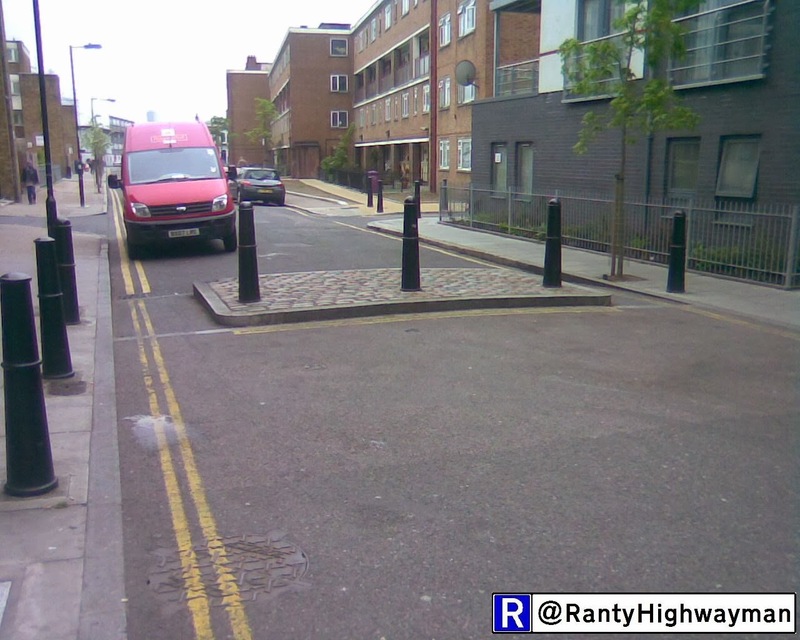 This would mean that on the street we would have a gate or drop-down bollard which could be used. I could have left them out, but in the event that the road needed to be opened for such work, it would need the TRO to be temporarily suspended and so it is often to have the exemptions in place of they are ever needed. OK, this has been a long-winded and probably rather boring post, but I wanted to show that the process takes a fair amount of work and indeed this comes with a financial cost. It is absolutely no difficulty at all, though, to allow exemptions for cyclists although we do need to define them and exempt them as they are classed as "vehicles" for the purposes of TROs - this goes for banned turns, one-ways and so on. Of course, it is also worth plenty of "pre" consultation with people who might be affected (positively or negatively) as it could draw out problems or issues early and allow changes to be made before the formal consultation process. If you want to read some more TROs, you could do worse than poke around Brighton & Hove Council's website!